& Now To Sleep by REN | Almost Chic. The short days and dark winter morning are continuing with a vengeance. Sometimes it can be a wee bit difficult to drag yourself out of bed each day. Add a shoddy night's sleep into the mix and it can feel nigh on impossible. I try my best to ease the pain of chilly mornings each winter by making sure I get the best shut eye possible. Usually this involves by upping my relaxing bedtime routine, all the chamomile tea and of course I break out the hot water bottle (correct, I am a 90 year old trapped in a 20 something's body). 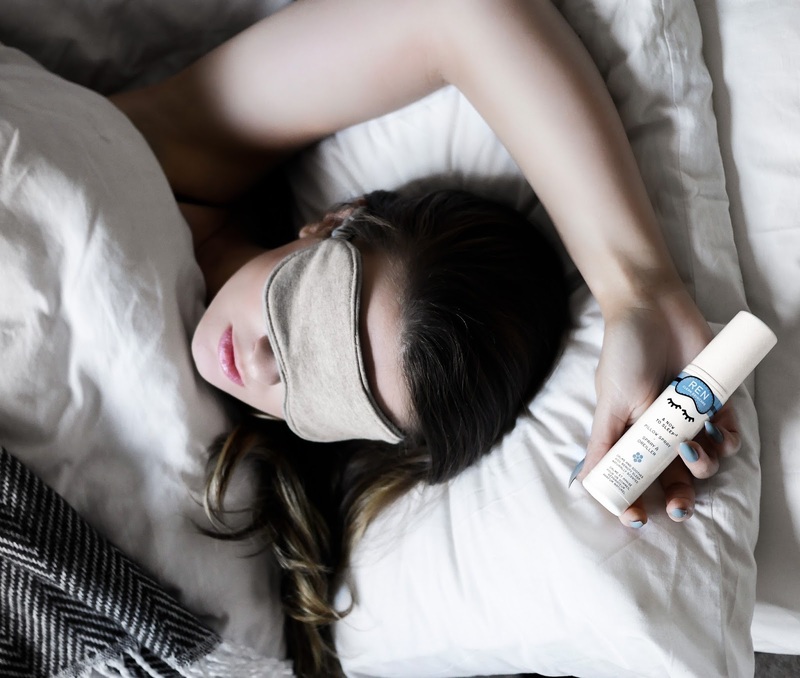 This November though, REN have stepped in to help with their new release, & Now To Sleep, a relaxing pillow spray. It's had me snoring right through the night for the last few weeks and I can't believe how much easier mornings have been. What is it? A relaxing, scented pillow spray. How do I use it? Spray over your pillows at bed time. Good to know: Cruelty free, suitable for vegans. More info? For detailed info and ingredients check out REN's website HERE. I must say that I've never tried a pillow spray, I know there are many others out there that people rave about. I, however, always thought them to be something of a fad. Until I actually tried one. REN's & Now To Sleep has converted me well and truly. It has quickly become a staple part of my night time routine. Over the last few weeks I've come to associate the smell of the mist with bedtime and have noticed that I drift off much, much quicker when I use it. I will point out though that this effect was gradual. Despite what I expected when I gleefully hopped in to bed at 8pm the first night I tried it - imagining that I would instantly be knocked out and have the deepest and best night's sleep of my life. This was not the case. My determination to have a good night sleep left me tossing and turning until the wee hours. I can only describe it as similar to when you have an abnormally early morning ahead (getting up for an early flight for example). You know, when you realise you will be tired so you pressure yourself to have an excellent night sleep as if your life depends on it. And all that pressure to have a great sleep results in the worst shut eye ever? Well that was me and this spray. I was so convinced that it was going to change my sleeping habits (and therefore my life) drastically and immediately that I could not sleep a wink. Needless to say, it was a ridiculous notion in the first place. Spoiler alert: a pillow spray will probably not change your life overnight. So after realising my mistake, I took a more relaxed approach to relaxing from then on! I wafted the spray over my pillows each night, spent half an hour reading a book and let myself drift off more naturally when I was actually tired. And this is when I discovered the magic of pillow sprays. As the nights went by and the relaxing scent of the spray became a sort of trigger to my brain that it was time to settle down. And now I can't go to bed without it, I took it on my recent holiday, because strange beds can be tricky to fall asleep in. I even stashed it in my in flight bag which worked wonders to help me doze off on the long plane journey. I find the most effective way to use it is combined with some sort of guided meditation app, podcast or YouTube video. If I go to bed anxious or with a million thoughts running through my mind popping one of these on helpsme to focus on breathing deeply and calmly which in turn ensures that I'm really inhaling all the scented goodness of & Now To Sleep. Leaving me soothed and ready for sleep within minutes. In conclusion to all this rambling, which is probably doing a good job of sending you to sleep I love it because it works. I'm not sure whether it's a placebo effect but I really don't care because the quality of my sleep has definitely improved and the time it takes me to fall asleep has more than halved. Some nights I don't even remember my head touching the pillow. I definitely recommend you give this a spritz. It might not be your favourite if: You swear by a strong lavender scent to help you relax. Though the spray does contain lavender its definitely not the most prominent smell. Frankincense & hops give the mist a slightly musky and peppery scent as opposed to the classic floweriness of lavender products. Personally I find this to be a welcome change but it might not be to everyone's taste. I definitely drink chamomile tea to relax before bed. Also, a couple sips of tea made from the leaves of my grandma's soursop tree knocks me the F out like magic. I would probably like the smell of this pillow spray. Lavender is such a pretty scent, so calming. There are many benefits in owning this type of business. When you are considering opening a health business, you have a lot to know about health & fitness discount. There are many benefits which include extra money, healthier life. A health fitness business is what one needs to get into shape.